Dana Levin’s most recent book of poetry is the remarkable Banana Palace (Copper Canyon Press, 2016). 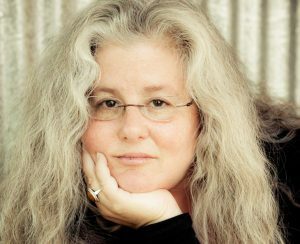 Her first book, In the Surgical Theatre, won the 1999 American Poetry Review/Honickman First Book Prize and went on to receive nearly every award available to first books and emerging poets. Copper Canyon Press also published her books, Wedding Day, in 2005 and Sky Burial in 2011. Levin’s poetry and essays have appeared in many anthologies and magazines, including The Best American Poetry 2015, The Arcadia Project: North American Post-Modern Pastoral, The New York Times, Los Angeles Review of Books, Boston Review, The AmericanPoetry Review, and Poetry. Her work has received fellowships and awards from the National Endowment for the Arts, PEN, the Witter Bynner Foundation and the Library of Congress, as well as the Rona Jaffe, Whiting and Guggenheim Foundations. A teacher of poetry for over twenty years, Levin splits her time between Santa Fe, New Mexico and Maryville University in St. Louis, where she serves as Distinguished Writer in Residence.